Cinnamonandzoeykisses: Two contenders finally done! 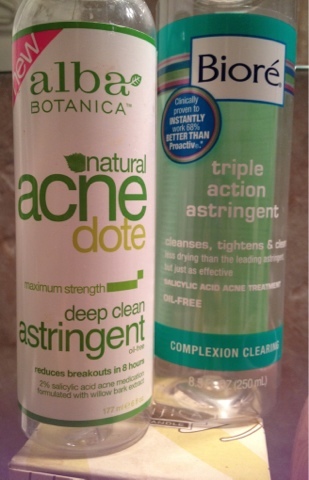 These two toners have been in my skin routine for 1+ years (I did purchase the Biore toner several months earlier). When I say these took forever, I mean they took forevvver! The Alba toner was a last minute purchase while browsing thru a local health store I was living near at the time. Due to the change of environment (diet, and stress were also culprits) my skin started behaving badly and I was left with not only spots everywhere, but also some cystic acne. Even prescription topical treatments did not help much. I had high hopes for Alba. Although it was not a quick fix by any means, it was a nice and refreshing change to the medicinal smelling Biore toner. Out of the two, Alba has the highest chance of repurchase in my opinion. And it would have to be a pretty good deal/sale going on! I'm always on the hunt for a good toner, any suggestions?